This work fills a significant gap in the current literature by providing a concise introduction to religious institutions and an insightful analysis of their role in world affairs. 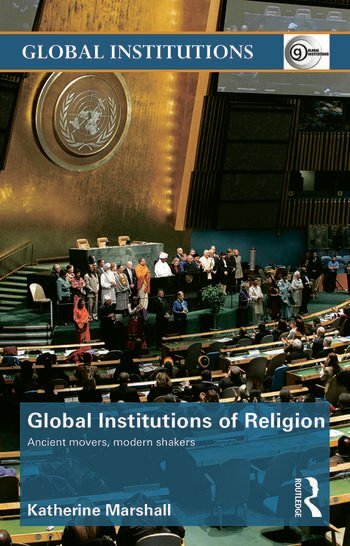 Focusing on formal institutions specifically dedicated to governing religious communities, the work examines the intersections between religious and other global institutions, set against the fundamental question: why and how do these intersections matter? The new forms that religious institutions are taking, their fit with human rights and democratic ideals, their changing nature in plural societies, are a highly relevant part of the global institutional picture and this book is essential reading for all students and scholars of global institutions, international relations and religion. Katherine Marshall is a senior fellow at the Berkley Center for Religion, Peace, and World Affairs at Georgetown University and Visiting Professor in the Government Department. As a long time development specialist focused on the world’s poorest countries, she worked for over 35 years with the World Bank and continues to serve as a senior advisor. For the past decade she has focused her work on issues around the links between development and religion. She is a visiting professor at the University of Cambodia, and is a member of the International Niwano Peace Prize selection committee.